You are here: Home / Safety / Children’s Big Rex and Friends Cloth Books RECALL! Children’s Big Rex and Friends Cloth Books RECALL! A red plastic dot sewn in the book contains high levels of lead. Lead is toxic if ingested by young children and can cause adverse health effects. Importer: St. Martin’s Press LLC, of New York, N.Y. Hazard: A red plastic dot sewn in the book contains high levels of lead. Lead is toxic if ingested by young children and can cause adverse health effects. Description: This recall involves “Big Rex and Friends” cloth books. The book has a black and white striped border with a red dinosaur on the cover. 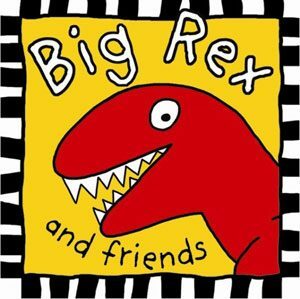 The words “Big Rex and Friends” are printed on the cover. ISBN 031249260X or 9780312492601 is printed on the back of the book. « Stork Craft Drop-Side Cribs RECALL!